The life-size bronze sculpture "Walking man I" by Alberto Giacometti sold for £65 million ($104 million) at Sotheby's auction in London on Wednesday, 3rd of February, 2010. 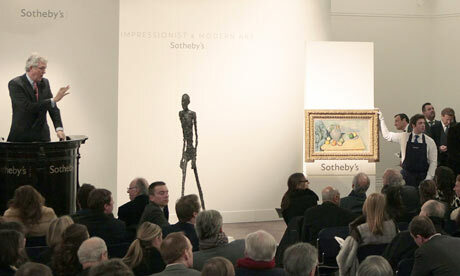 It took just eight minutes before an anonymous phone bidder placed the winning bid after Giacometti's sculpture opened for bidding at £12m at Sotheby's (BID) auction house in London. "Walking man I" by Alberto Giacometti now ranks as one of the most expensive works of art ever sold and the most expensive sculpture ever sold at auction. For Sotheby's, Wednesday's Impressionist and Modern Art auction was a huge success, yielding a total of £147 million versus its pre-sale estimate of £69-102 million (before buyer's premium). Perhaps more than anything else, the auction proves that despite the economic crisis individual wealth is well and alive, if only limited to the few. It also proves the attractiveness of Sotheby's business model, which benefits from a duopolistic industry structure.